Corner detail of the Samsung QE82Q950R. Rear view of the Samsung QE82Q950R. Side view of the Samsung QE82Q950R. Rear angle view of the Samsung QE82Q950R. The new 8K AI system in the QE82Q950R does an amazingly good job of adding millions - and millions - of pixels to sub-8K sources. What is the Samsung QE82Q950R? 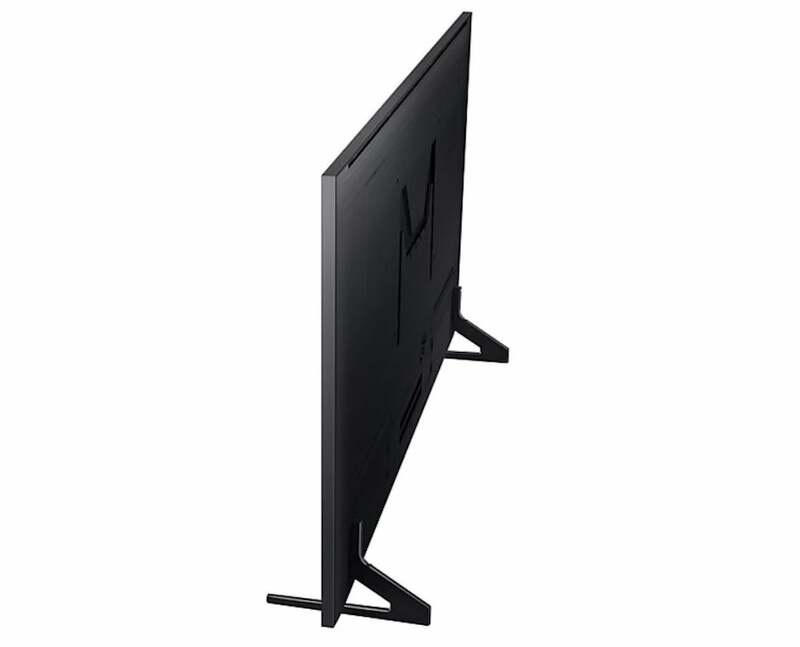 The Samsung QE82Q950R is the first model from the Korean brand’s second generation of 8K TVs. It sports an 82-inch screen, and improves over Samsung’s original Q900R 8K sets in multiple ways. In particular, it carries Samsung’s new wide-angle viewing technology, better connectivity, and an improved 8K upscaling system. And the results are nothing short of spectacular. Related: What is 8K TV? While the Samsung QE82Q950R differs from the original Q900R 8K series in some ways, its design is pretty much identical. At least when it’s switched off. You get the same dark, narrow frame wrapped around the colossal screen, and the same pair of simple, narrow feet. Unless you wall hang it, of course. It also uses an external connections box, as did its predecessor. This enables the screen to receive its power, pictures and sound via a single cable. 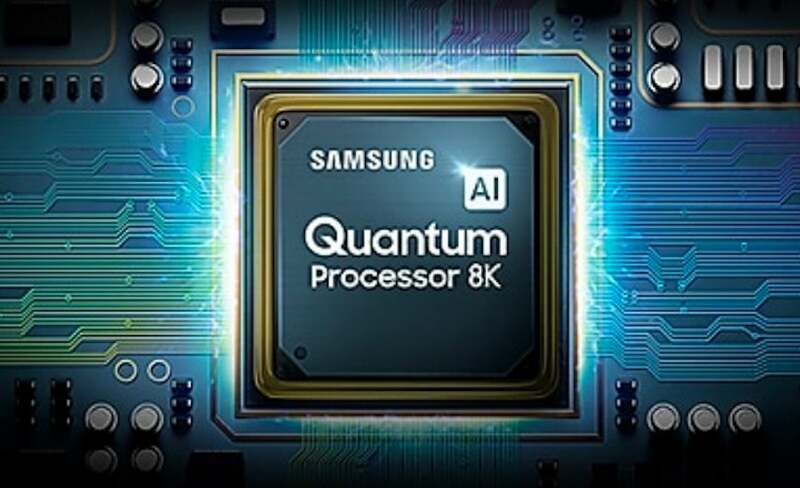 The QE82Q950R again follows the lead of the Q900R series by supporting Samsung’s Ambient mode. This lets you replace the usual black screen when the TV isn’t being watched with a large choice of screensavers. These could even include digital photographs of your wall, so that the TV blends in with your decor. 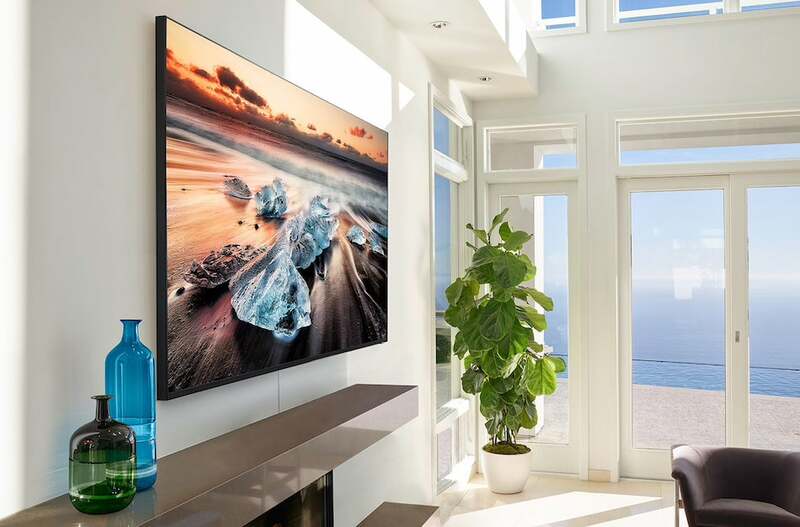 Samsung has expanded the screensaver options available for its gen-two 8K TV. There are now some cool animations, as well as new lighting options designed to cast different hues into your room. The screen feels robustly built – although I do worry slightly about the strain put through the four fairly small screws that attach the feet. The main thing to focus on here is the differences between the QE82Q950R and its Q900R predecessors. These start with its connections, with the new model making one of its four HDMIs capable of handling 8K sources at up to 60 frames per second. The original Q900R’s HDMIs could handle 8K only up to 30fps (although Q900R owners can now get a free 8K/60Hz upgrade box). Other connections on the QE82Q950R – including three USB ports – remain the same. The most eye-catching picture upgrade of the QE82Q950R is its wide-angle viewing support. First seen on Samsung’s QE65Q90R, this overcomes LCD’s typical viewing angle limitations by adding two new layers to the LCD panel design. One better focuses the light from the backlight system, while the other scatters the light in more directions as it emerges from the screen. 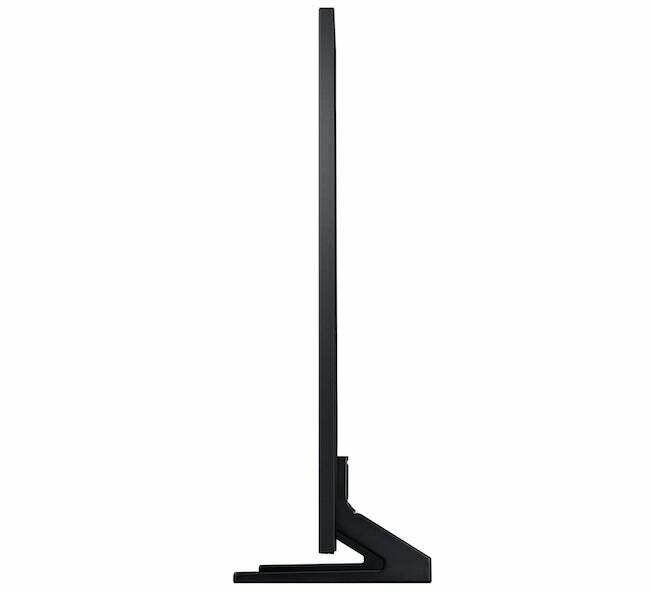 This approach delivers OLED-like viewing angles without the general contrast loss caused by the wide-angle system Sony developed for its ZF9 TVs. The QE82Q950R also carries a better scaling engine. This is because it uses the “AI”-enhanced 4K upscaler found in Samsung’s new Q90R 4K flagships for the first part of its two-stage upscaling system, meaning it can pass better quality source images into the second, 8K part. This is a pretty important enhancement given that almost everything you’ll watch on the 8K QE82Q950R right now will have to be upscaled. 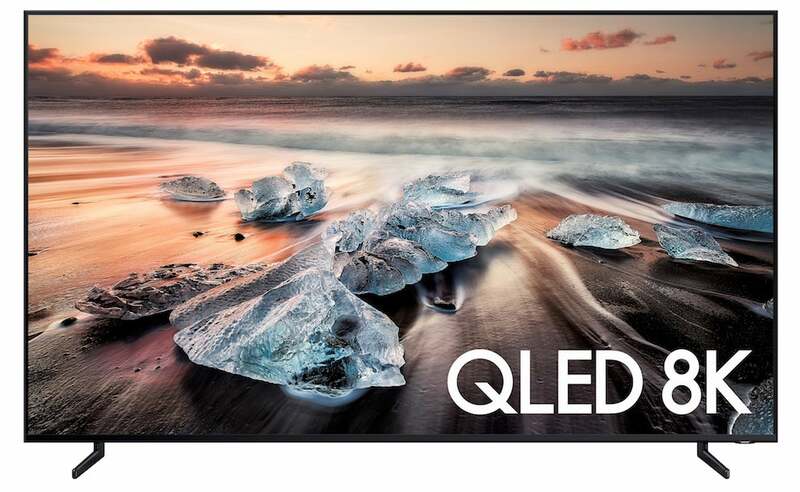 While the QE82Q950R “borrows” the new 4K upscaling chip from Samsung’s flagship Q90R 4K range, it doesn’t also get that model’s new, dedicated backlight control chip. As we’ll see later, though, this isn’t necessarily a bad thing. One last key improvement the QE82Q950R sports makes over the Q900R is a new black filter on the screen’s front. This absorbs ambient light uncannily well, boosting the TV’s apparent black level response in typical living room conditions. Note, though, that the filter can diffract very bright direct light into a slightly distracting rainbow effect. So, if possible, try to avoid placing the screen directly opposite wall lights. The QE82Q950R provides some smart features that weren’t available on its predecessor. Samsung’s own voice control/recognition system now responds to more natural speech while still integrating with pretty much every part of the TV’s setup and content search systems. The QE82Q950R also works with external Amazon Alexa and Google Home voice-recognition devices. 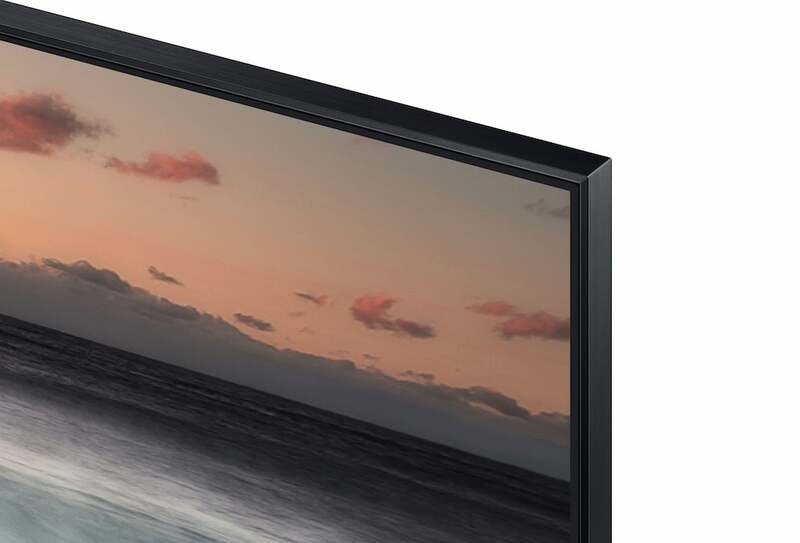 As with Samsung’s debut 8K TVs, the QE82Q950R’s lighting system places its LEDs directly behind the screen. And it drives these LEDs with a local dimming system that works across an impressive 480 zones. This should be sufficient to provide the sort of local light control that an 82-inch LCD TV really needs. Samsung’s “Eden” smart platform covers a huge range of apps and services. These include the 4K, HDR versions of Netflix, Amazon Prime Video and YouTube. UK users get the full suite of key broadcaster catch-up apps, too – although, sadly, they don’t sit within the handy Freeview Play container. It’s a shame that the QE82Q950R doesn’t play the handful of 8K videos currently available on YouTube. It isn’t as if we have many native 8K sources to choose from right now, after all! 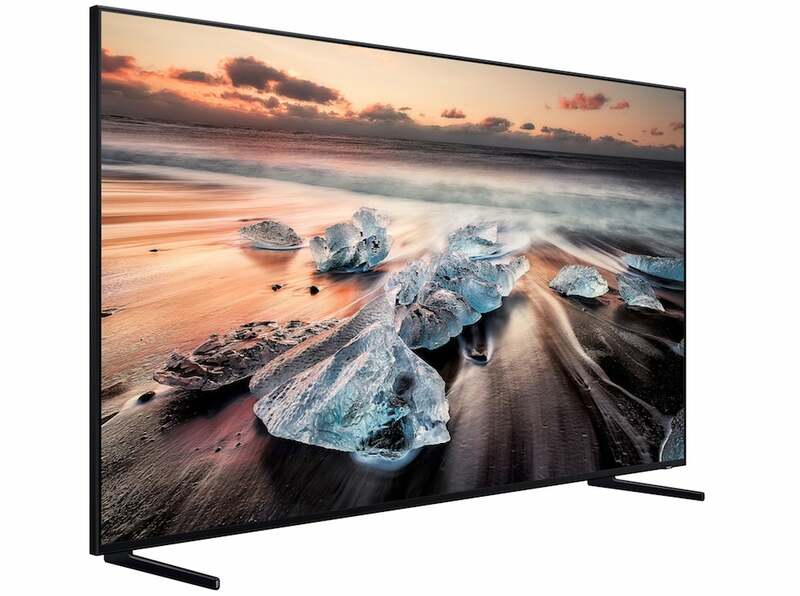 As with Samsung’s other 2018 and 2019 HDR TVs, the QE82Q950R supports the industry standard HDR10 system, the (predominantly broadcast) HLG format, and Samsung’s HDR10+ system. This latter format, which improves picture quality by adding extra scene-by-scene picture information, is growing in importance. We now have 20th Century Fox, Lionsgate and IMAX releasing 4K Blu-rays in it, alongside all Amazon HDR shows. It’s nonetheless a shame that the QE82Q950R doesn’t also support the rival Dolby Vision platform. This works in a similar way to HDR10+, but is available on a much wider range of sources. One other feature more surprisingly not supported by the QE82Q950R is eARC. This means you can’t pass uncompressed “TrueHD” Dolby Atmos or DTS:X object-based audio formats (presumably received from 4K Blu-ray players) to compatible soundbars or receivers. Although the TV can still use its basic ARC system to deliver compressed Dolby Atmos from built-in apps (such as Netflix) via the Dolby Digital Plus carrier format. The QE82Q950R’s native 8K resolution doesn’t stop it delivering a couple of key gaming features. 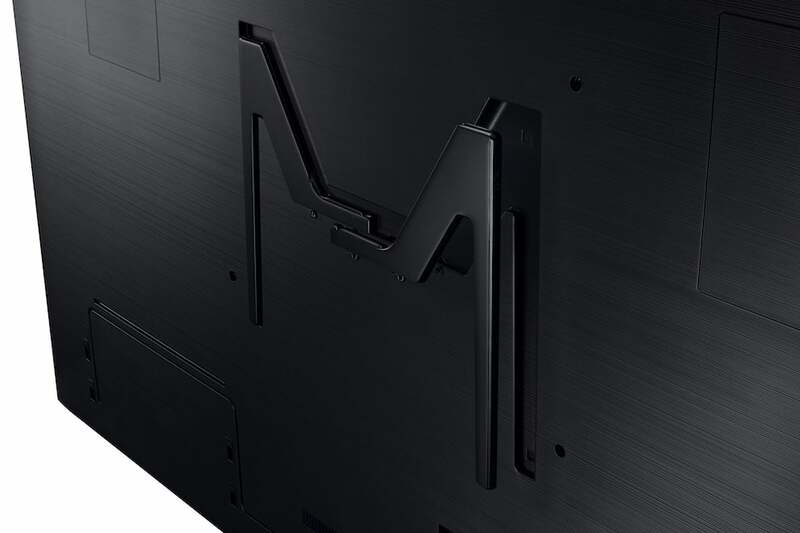 First, support for FreeSync variable refresh rates, and second, support for automatic switching to the TV’s Game mode when game sources are detected. The Game mode reduces input lag to just 15ms. There’s also a new Dynamic Black Equaliser that lets you raise the black level of dark parts of game graphics without affecting the brightness of everything else. The idea being that you can then spot enemies hiding in the dark more easily. AV purists might prefer the Samsung QE82Q950R’s Movie preset, but personally I think this leaves pictures looking rather flat. It fails to take full advantage of the TV’s brightness and colour capabilities, too. I suspect the Standard preset will be the one most people will prefer. Just make sure you turn off the Eco mode in the General menu when using Standard mode. If you don’t, the picture will become depressingly dull during dark room viewing. Also consider adjusting the Digital Clean View feature for different sources. It’s best for good 4K sources, Low for HD sources and High for low quality/heavily compressed/SDR sources. Alas, the Auto mode isn’t quite as clever as I’d like. The same goes for the QE82Q950R’s motion processing. The Auto mode can cause noticeable unwanted side effects, even with high-quality sources. So either turn it off, or choose Custom, with blur and judder elements set to three or four each. One other setup quirk concerns the Contrast Enhancer. During my review, the High setting for this defied expectation by making the picture actually look darker than the Low setting. This could be a mistake that Samsung will ultimately fix. Right now, though, that’s where we are. And actually, the currently less aggressive High setting is the best option for me. The Samsung QE82Q950R makes an even better case for 8K TVs than its hugely impressive predecessor. Despite the fact that there continues to be a dearth of native 8K content. A big part of this is down to its upscaling being even better than that of the Q900Rs. The upgraded 4K chip in the upscaling chain delivers a marked boost in sharpness and detail with all sub-8K sources. Even – actually, especially – with high-quality 4K images, such as those from 4K Blu-rays. There’s a much more granular, refined look to detail in the new TV’s upscaled pictures, as well as less interference from source noise. As a result, images look noticeably crisper and more detailed than they do on typical native 4K TVs. This sense of detail with upscaled content reduces as you step down the picture source chain. But only because the processing sensibly shifts focus from over-sharpening grubby-looking sources to cleaning up video noise – again, something that the upscaler does remarkably well. Especially if you take the trouble to adjust the Digital Clean View feature along the lines suggested earlier. Maybe the most important thing about the QE82Q950R’s upscaling, though, is the points-per-inch effect. This means you can get pretty much the same number of pixels per inch of picture on an 82-inch 8K screen that you can get on a much smaller 4K screen. As a result, the picture doesn’t look softer and less clean and crisp as it would on an 82-inch 4K screen. The importance of this is hard to convey in mere words. Having seen an 85-inch 8K screen running against a 30-inch 4K mastering OLED screen, I can confirm that the difference is really easy to see with your own eyes. If you can find some native 8K content to feed into a QE82Q950R, the picture story gets even more exciting. The results are truly breathtaking, giving you pictures containing levels of detail and clarity with which no similarly huge 4K TV can compare. An image of a stained-glass window (from a specially created Samsung 8K Demo reel) looks so pristine, detailed and life-like that it literally feels like the TV has turned into the window! With a shot looking straight down on New York’s Central Park, meanwhile, the detail is such that you can make out individual windows and even brickwork in buildings, despite the considerable height from which the shot is taken. Other cityscape 8K footage provides a reminder of how more resolution helps pictures resolve a greater sense of depth and three-dimensional space. Of course, there are people out there who will swear blind that 8K can’t deliver any picture benefits over 4K. All I can say to that is that while 8K’s impact reduces on smaller screens (it becomes pretty marginal at 65 inches), on this 82-inch set the difference is clear for all to see. 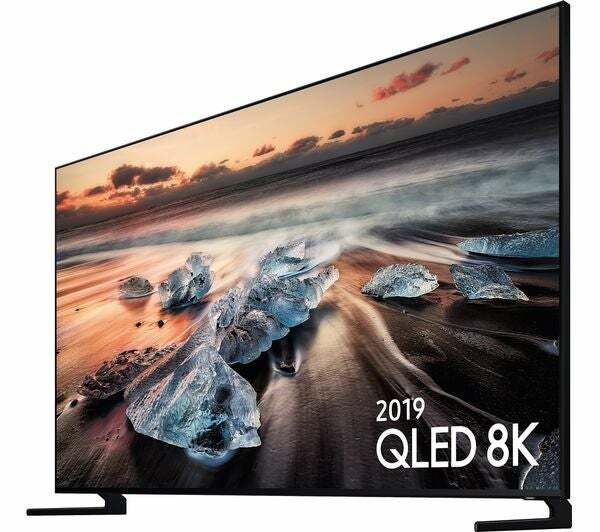 Even if you’re still not convinced about 8K’s charms while there remain no 8K sources, the QE82Q950R has a mountain of other attractions to tempt you. For starters, it’s immensely bright. I measured 2750 nits on a 10% window in Standard mode, and 1670 nits in the less explosive Movie mode. This isn’t as high as the 4000 nits Samsung claims for the TV, but I suspect the screen really can hit that sort of level with very small bright highlights. Having so much light at its disposal enables it to deliver today’s HDR sources with a fearsome punch. The brightest parts of HDR images look more intense and spectacular than they ever have on a TV before. Especially with 4K Blu-rays that have been mastered to peak brightness levels of 4000 nits, such as the recently released Spider-Man: Into The Spider-Verse. It isn’t just the amount of brightness that unlocks HDR’s charms so superbly, though. Having so much brightness also expands the screen’s colour volume (the combination of colour and light). This means it’s able to express a jaw-dropping amount of the full colour palette you get with HDR/wide colour sources of the sort found on 4K Blu-rays and HDR streaming services. The fact that every single HDR source I tried looked incredible on the QE82Q950R isn’t only down to its brightness, 8K sharpness or (QLED assisted) colour response. The set also delivers a superlative black level/backlight performance. Dark parts of the picture look exceptionally black by LCD TV standards. Not quite as inky, perhaps, as on Samsung’s Q900R, but deeper than those of any other king-sized LCD TV. Which is quite something in the context of the extreme amounts of brightness the screen also pumps out. What’s more, the QE82Q950R retains more detail in the darkest parts of the picture than the Q90R – at least in Standard mode. Related to this, it also doesn’t dim very small bright areas (to avoid backlight blooming) as much as the Q90R. Or as much as the Q900Rs did in their initial release before a firmware updated sorted out this issue. It’s notable, too, how the QE82Q950R’s handling of dark scenes is bolstered in bright rooms by its light-absorbing filter. Are the QE82Q950R’s black levels quite as good as those of OLED TVs? No. But they’re excellent, and retain their integrity and uniformity in the context of peak brightness, which goes considerably beyond the capabilities of OLED TVs. For all their brilliance, the Samsung QE82Q950R’s pictures aren’t flawless. For instance, while its viewing angle support is ground-breakingly great for an LCD TV, watching from down the TV’s sides can introduce mild backlight blooming around stand out bright objects. Inevitably, this reduces contrast in those areas – although not to the extent of the general loss of contrast with LCD screens. I’ve seen evidence to suggest that the way Samsung’s wide viewing angle algorithms work has the potential to reduce brightness with off-axis viewing, as well as impacting fine detail resolution, especially in relatively dark areas. However, to the naked eye, from anything like sensible viewing distances, the QE82Q950R I tested really didn’t seem to suffer badly in either area. The only really marked viewing-angle issue was the raised blooming. It could be that the workings of the viewing-angle algorithms are involved with the occasional loss of small areas of detail in dark scenes – even when viewing from directly on – noted in my review of the 4K Samsung QE65Q90R. This would also explain why the issue doesn’t occur as obviously on the Q950R set, since the 8K model has so much more brightness at its disposal to combat any dimming effects of the wide-angle algorithms. While the upscaling engine is generally exceptional, especially when you stop to think about how many pixels of picture information it’s conjuring up, it can leave certain types of dense picture information – mostly distant trees and foliage – looking a little softer than the rest. The Auto Motion mode can cause slightly more unwanted side effects than it perhaps should on such an otherwise clever TV. Although you can get round this via the provided picture adjustments. The new 8K AI system in the QE82Q950R does an amazingly good job of adding millions – and millions – of pixels to sub-8K sources. Similarly, as noted earlier, the upscaling can deliver better results with some manual input on the Digital Clean View feature than sticking with its Auto mode. These issues are pretty small to anyone willing to put a bit of leg work into getting the best from the QE82Q950R. And surely if you’ve just spent ten grand on a TV, you won’t mind making the odd adjustment to maximise the return on your investment? Especially when a sensibly set up Samsung QE82Q950R delivers what are for me the best all-round pictures I’ve seen on a television. It seems a shame after that picture high note to have to report that the QE82Q950R’s sound isn’t as good. A lack of forward projection leaves it sounding slightly muffled and lacking in attack. It delivers a wide soundstage, at least, and positions effects quite accurately within that soundstage. Notwithstanding the way those effects always sound like they’re slightly behind the on-screen action. One last key performance issue to cover is the QE82Q950R’s response time. I measured this at just 15.4ms using the Game preset. That’s a remarkably low figure by any TV standards, never mind one that’s having to upscale pictures to 8K. Why buy a Samsung QE82Q950R? The fact that the Samsung QE82Q950R costs £10,000 immediately places a pretty strict limit on the size of its potential market. In addition, some will feel that they just don’t want to commit so much money to an 8K TV until, at least, there’s more real 8K content around. Some AV enthusiasts will also find it hard to understand why a £10,000 TV doesn’t include Dolby Vision decoding. Against these perfectly sane arguments comes the simple, heart-tugging fact that the QE82Q950R delivers the all-round most spectacular and engaging pictures of any big-screen TV I’ve tested. The 8K resolution plays its part in this, for sure. But it’s actually other picture features – its brightness, colour range, contrast and new viewing-angle prowess – that seal the sumptuous deal. 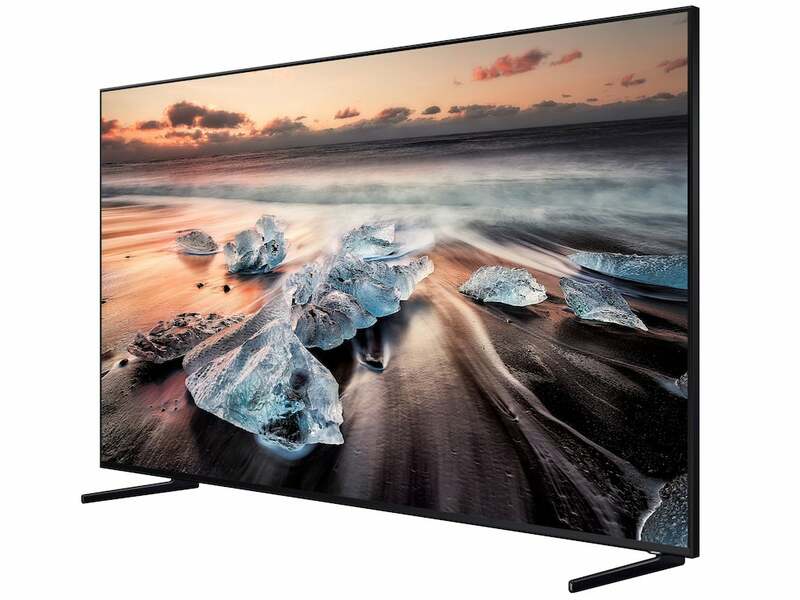 While its lack of Dolby Vision support is frustrating, the Samsung QE82Q950R’s pictures are so good that, if I had £10,000 and a decent-sized living or home cinema room, then this is the TV I’d be buying.